Village – Langhiala, district Moga. Children : Bibi Gurpreet Kaur and two sons Bhai Satwant Singh and Bhai Satnam Singh. Bhai Sahib and fellow singhs were passing through the village of Sangatpura, as Bhai Sahib lead the convoy of fellow singhs under his command, the black cats ambushed Bhai Sahib. The black cats fired blind rounds of bullets at Bhai Sahib and Bhai Sahib instantly attained shaheedi. This is also a true story. 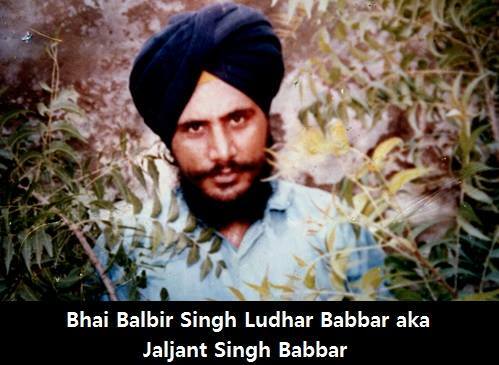 Shaheed Bhai Balbir Singh Ludhar was born in 1962, in Village Langhiala, district Moga. Bhai Sahib was born to Sardar Banta Singh and Mata Gurdial Kaur. Bhai Sahib had a very good physic for his age, which is why he was given the name “Ludhar”. Bhai Sahib had 4 sisters and 3 brothers. Bhai Sahib did his primary education the villages of Langhiala and Alamwala. Bhai Sahib had a very merciful character and spent most of his time in the company of Saints. Bhai Sahib was married to Bibi Jaspal Kaur and had a daughter, Bibi Gurpreet Kaur and two sons Bhai Satwant Singh and Bhai Satnam Singh. The family are Gursikhs and live according to the Sikh values. Bhai Sahib was great poet. Bhai Sahib’s sister, Bibi Swarnjit Kaur is the widow of Shaheed Bhai Harminder Singh Grewal. Bhai Sahib and other Sikh youths met at Bibi Kahan Kaur Gurudwara to talk about the Sikh struggle. The police had surrounded the gurudwara, this curfew on the gurudwara was maintained for 8 days by the Punjab police. To get the singhs out of the gurudwara the police used guns to force singhs out. In this blind firing of bullets by the police many singhs attained shaheedi. Bhai Sahib managed to escape the police curfew by jumping over roofs of the neighbouring houses. Then in September 1984, Bhai Sahib was arrested for the first time and was sent to Faridkot jail for 3 years. After spending his sentence in jail, Bhai Sahib was finally released in 1987 and now stayed with the family for a while. Bhai Sahib was once again arrested from the village of Malhian and this time Bhai Sahib was blindly tortured by the Punjab police. For 45 days, Bhai Sahib was taken from one torture centre to another, but Bhai Sahib gave no information to the police. The police charged Bhai Sahib with many fake cases and locked him up in Faridkot jail. Bhai Sahib was released in March 1990. Bhai Sahib continued doing sewa for the Sikh panth, just like he used to before going to jail. Bhai Sahib was well known for being brutally tortured by the police and still not giving information of fellow singhs. Bhai Sahib was a master of disguises that even is family was easily fooled by Bhai Sahib. In 1991, Rajasthan Police arrested Bhai Sahib and Shingara Singh Korewal in the Raisingh Nagar area, the police notified the police in Punjab about the capture of these two singhs. Shingara Singh died was martyred from intense torture but Ludhar was released afterwards. Both singhs were taken to Raisingh Nagar’s torture centre and brutally tortured for information on other singh of the Sikh Freedom Movement, but these brave singhs didn’t even say each other’s name. Bhai Shingara Singh Korewal didn’t say a word beside to simran. Punjab police of Bagha Purana collected both of the singhs and made their way back to Punjab. On the way, the police cut Bhai Shingara Singh Korewal and put red chillies into the wounds, while the police tied the hair of Bhai Sahib to back of the gypsy and dragged Bhai Sahib from his hair. Due to this Bhai Sahib had many wounds all over his body and much of his hair came out. Still none of the singhs said nothing about each other or their fellow singhs. As Bhai Shingara Singh Korewal had lost too much blood, he attained shaheedi on the way, near the village of Dabwali. The police filled his body up with bullets and made a fake encounter of his shaheedi. Later Bhai Sahib was released. After this, Bhai Sahib went Underground. When Bhai Sahib’s parents said, “Ludhara, think about your family, house and your farms.” Then Bhai Sahib answered, “Now you look after everything and I will look after the enemies of the Sikhs.” The Babbar Khalsa gave Bhai Sahib secret name, Bhai Jaljant Singh Babbar. When Bhai Sahib was tortured by the Punjab police, his hair was very long and heavy. Whenever the police pulled his hair out, Bhai Sahib would put that hair in his pocket. Bhai Sahib had sent all these hairs to his family to look after. Bhai Sahib had done many actions with Bhai Balwinder Singh Ganga, Bhai Sulakhan Singh Vehrowal, Bhai Harminder Singh Grewal and Bhai Dhanna Singh. Bhai Sahib could not forget the shaheedi of his very close friend Bhai Shingara Singh Korewal. One day on 5th September 1991 Bhai Sahib and fellow singhs were passing through the village of Sangatpura, as Bhai Sahib lead the convoy of fellow singhs under his command, the black cats ambushed Bhai Sahib. The black cats fired blind rounds of bullets at Bhai Sahib and Bhai Sahib instantly attained shaheedi.